Stijn Devolder (born 29 August 1979 in Kortrijk, West Flanders) is a Belgian professional road bicycle racer, riding for UCI ProTeam Trek–Segafredo. He rode for U.S. 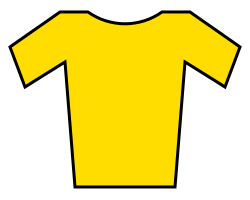 Postal Service, from 2004 to 2007, before signing for Quick-Step in 2008. Devolder won his first professional race at the 2004 Four Days of Dunkirk, winning stage 4. His most prestigious victories are the 2007, 2010 and 2013 Belgian National Road Race Championships, the 2008 and 2009 Tour of Flanders, and the 2008 and 2010 Tour of Belgium. Devolder is a competent climber but his main strength lies in the individual time trial. Devolder led the Quick-Step squad in the 2008 Tour de France but fell off the back and almost immediately stepped off his bike on the Ascent of the Col Agnel. Devolder left Vacansoleil–DCM at the end of the 2012 season, and joined RadioShack–Leopard on a two-year contract from the 2013 season onwards. 1 2 "Devolder signs two-year deal with RadioShack-Nissan". Cycling News. Future Publishing Limited. 14 September 2012. Retrieved 6 October 2012. 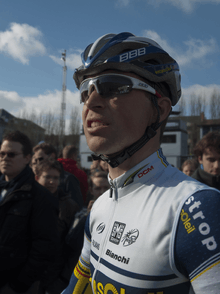 Wikimedia Commons has media related to Stijn Devolder.